Maruti Suzuki India unveiled the Stingray last week. Targeted at the youth demographic and pitted against Wagon R from their own stable, this boxy compact is quite unattractive, I daresay. The brand communication also comes across as trying too hard to conform. The tagline reads ‘My thing. Everything’ – not sure what that means and how it fits. The Maruti Suzuki Stingray brand website details the features, specifications, exterior and interior views. It also lets users explore the vehicle around themes like style, safety, performance etc. The site is static but functional and does its job of disseminating information. As with most Maruti Suzuki launches, this one was also covered through high quality live streaming, an archived video of which you can find on the site. ‘Everything about me, packed in one’; ‘With My Stingray I now have it all because that’s my thing’. Really?! 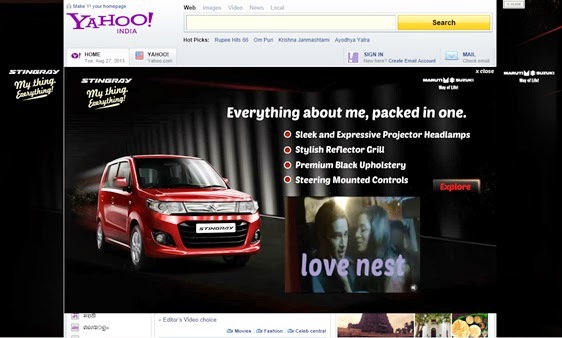 Maruti Suzuki is promoting the brand website through home page takeovers on key publishers like Yahoo! India, in addition to social media activations on Facebook and Twitter.